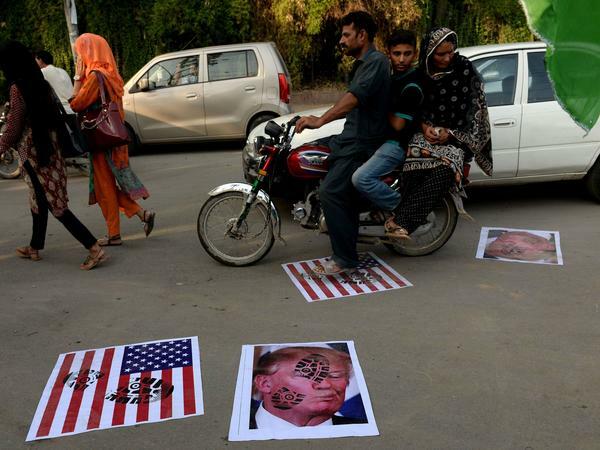 A Pakistani motorcyclist rides over images of President Trump in August 2017 after Trump accused Pakistan of harboring militants. The suspension is part of a broader pullback in military aid for Pakistan announced by the Trump administration in January. The administration says Pakistan is not taking strong enough steps to combat the Taliban and other groups. Pakistan, which serves as a key route for transporting supplies to U.S. forces in Afghanistan, has repeatedly denied harboring terrorists. The aid that's being suspended comes from the Coalition Support Fund (CSF), which is used to reimburse U.S. partners for logistical and military support to U.S. military operations in the region. "Due to a lack of Pakistani decisive actions in support of the South Asia Strategy," the $300 million was redirected to "other urgent priorities" before those funds were set to expire on September 30, U.S. Army spokesperson Lt. Col. Koné Faulkner told NPR. The South Asia Strategy, announced by President Trump last August, encompasses Afghanistan, Pakistan, India and the Central Asian nations and aims in part to "stop the resurgence of safe havens that enable terrorists to threaten America," according to a press release from the Department of Defense. Extremists often use Pakistan to take refuge from American military action in Afghanistan. "Pakistan has much to gain from partnering with [this effort] in Afghanistan," the president said during a speech last August. "It has much to lose by continuing to harbor criminals and terrorists." Under the Department of Defense's Appropriations Act of 2018, signed by the president in March, Pakistan would not be refunded for any defense operations unless the Secretary of Defense and Secretary of State certified that it is "cooperating with the United States in 12 counterterrorism efforts." The announcement over aid comes as Secretary of State Mike Pompeo and Chairman of the Joint Chiefs of Staff Gen. Joseph Dunford are preparing to meet this week with Pakistan's newly elected prime minister, Imran Khan. From there, Pompeo and Dunford will travel to India, Pakistan's main rival, for talks with Prime Minister Narendra Modi. Khan inherited a struggling economy, and is expected to negotiate with the International Monetary Fund for a bailout worth upwards of $12 billion, according to the New York Times. Last month, Pompeo warned that the IMF bailout shouldn't be used to pay off debts owed to China. Earlier this year, the U.S. accused Pakistan of sponsoring extremist groups, including the Taliban, and requested the country be placed on a global terror "gray list" that would make it more difficult to obtain international loans. Pakistan was able to avoid landing on the list. On Sunday, Pakistan's Foreign Minister, Shah Mehmood Qureshi, said he hopes Pompeo's visit "will be done in an amicable matter, strengthening the ties," reported local press. "We continue to press Pakistan to indiscriminately target all terrorist groups, including the Haqqani Network and LET in the region," Lt. Col. Faulkner said, referring to the terrorist group Lashkar-e-Taiba. "DoD is awaiting congressional determination on whether this reprogramming request will be approved or denied." The Defense Department will receive that congressional response before September 30, when the funds expire. All right, the relationship between Washington and Islamabad has already been pretty tense, and now this. The Pentagon says it is going to suspend $300 million in aid to Pakistan. The Pentagon says Islamabad is just not doing enough against terrorists. Here's NPR's Emily Sullivan. EMILY SULLIVAN, BYLINE: The suspension is part of a broader one announced by President Trump in January of this year. The Coalition Support Fund will be hit with those cuts. Its funds are used to reimburse Coalition partners for logistical and military support of U.S. military operations, like the war on terror. It was created in October 2001 following the war in Afghanistan. Civic aid to the country isn't affected. A spokesperson for the U.S. Army told NPR the cut was due to a lack of Pakistani support of the South Asia strategy by harboring militants. The strategy announced by Trump last August aims to stop a resurgence of terror in peaceful areas. PRESIDENT DONALD TRUMP: We can no longer be silent about Pakistan's safe havens for terrorist organizations, the Taliban and other groups that pose a threat to the region and beyond. SULLIVAN: Pakistan, which serves as a key route for transporting supplies to U.S. forces in Afghanistan, has repeatedly denied protecting terrorists. Spokesperson Kone Faulkner says the funds will be redirected to other urgent priorities before they were set to expire on September 30. The announcement comes at an interesting time. Pakistan's newly elected Prime Minister Imran Khan took office just weeks ago. He inherited a struggling economy and is expected to negotiate with the International Monetary Fund for a bailout. Days from now, Secretary of State Mike Pompeo and chairman of the Joint Chiefs of Staff General Joseph Dunford will head to Islamabad to meet with Khan. The DOD is awaiting congressional confirmation of the reprogrammed $300 million. They'll receive that response before September 30 when those funds expire. Emily Sullivan, NPR News, Washington. Transcript provided by NPR, Copyright NPR.